(Chilmark, Mass., Nov. 28, 2003). There are two projects I would like to undertake here at the homestead in Hamlin. One is to install a wind turbine so we can generate our own power. the other is to construct stone walls - across the front of the property and around a possible patio in the back of the house. Both projects require a commitment to and investment in place that I find simultaneously foreign and inviting. There is politics here too. Obviously, there is the fact that walls mark boundaries and define property. Some (many?) 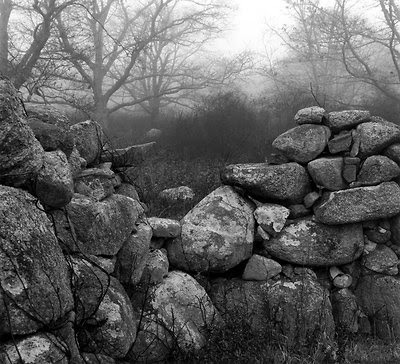 stone walls are the product of forced labor - slaves who could do the hauling and piling. Others, we are assured, are free of such troubling history. * You can find the quoted passage at the end of this notice of Mariana Cook's terrific wall series today in The New York Times along with a link to these two earlier notices of her work.